A beautiful sarcophagus on display. Decoration of the inner part of a sarcophagus. Part of a beautifully decorated sarcophagus. Located in Luxor, the Mummification Museum presents the ancient Egyptian art of mummification and displays related artifacts and mummies. Here you will learn about the mummification techniques specialized to embalm many animal species, such as crocodiles, cats and fish. Mummified animals are unique to the collection of this museum. You will also see mummification tools, embalming materials, wooden statuettes and a fine set of canopic jars. There are also animal mummies including a crocodile, a cat and a ram of Khnum with its gilded case from Elephantine. There are also ancient tablets that record the funeral journey from death to burial. The museum is divided into the Hall of Artifacts, Lecture Hall, Video Room and the cafeteria. Opened to the public in 1997, the Mummification Museum illustrates the processes used in the preservation of both human and animal remains, a practice believed by the ancient Egyptians to be a critical part of the quest for eternal life. 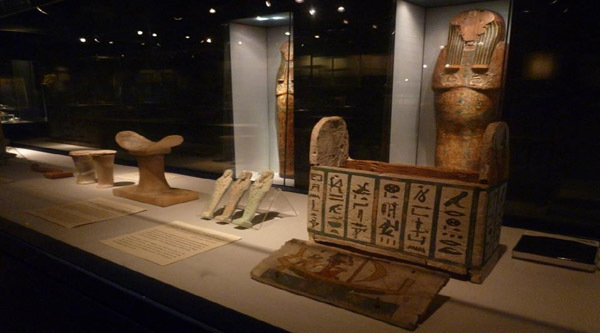 The museum displays human and animal mummies, tools used in the mummification process, and examples of the types of objects traditionally buried with the dead in Pharaonic times. A collection of well-preserved mummy-cases, mostly from the dryer climate of Upper Egypt, is displayed in the entrance to the museum along with a statue of Anubis, the jackal-headed god who leads the dead into the underworld.